It is planned to conduct a Recognition of Prior learning (RPL Level 2) activity and mentoring workshop in Adelaide in late February or March 2017 at the DVA South Australia State Office. A number of Expressions of Interest (EOI) have been received from South Australian Advocates who have filled out the form on the ATDP website. If you have completed the form, you will automatically receive an invitation in the new year to attend the workshop. For those of you who are yet to apply, you are encouraged to read the information below and fill out the on-line form so that an invitation can be sent to you to attend the workshop. Places are limited and will be offered in accordance with the order in which EOI are received. - experienced Advocates (Levels 2, 3 or 4) who are currently, or would like to become, mentors. Mentoring: The workshop covers what mentoring is and why it is a key part of ATDP; the mentor’s role and responsibilities; and how to develop and support your ‘mentee’. To complete the form, you will need to supply details of the official from your ESO who can be contacted to endorse your nomination and agree to cover your expenses if you need to travel to the workshop. 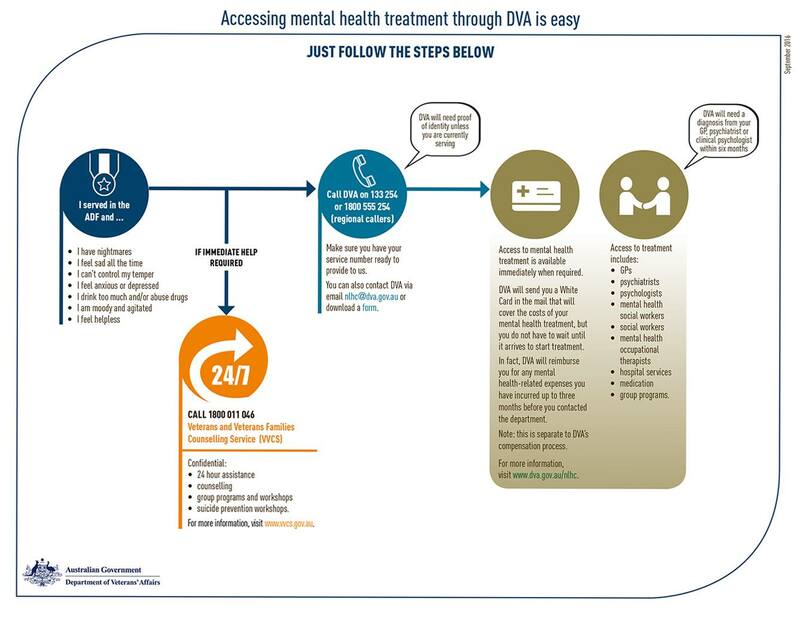 If you have any questions, or if you would like more information about ATDP, please visit the DVA website (www.dva.gov.au) or send an email to ATDPenquiries@dva.gov.au. 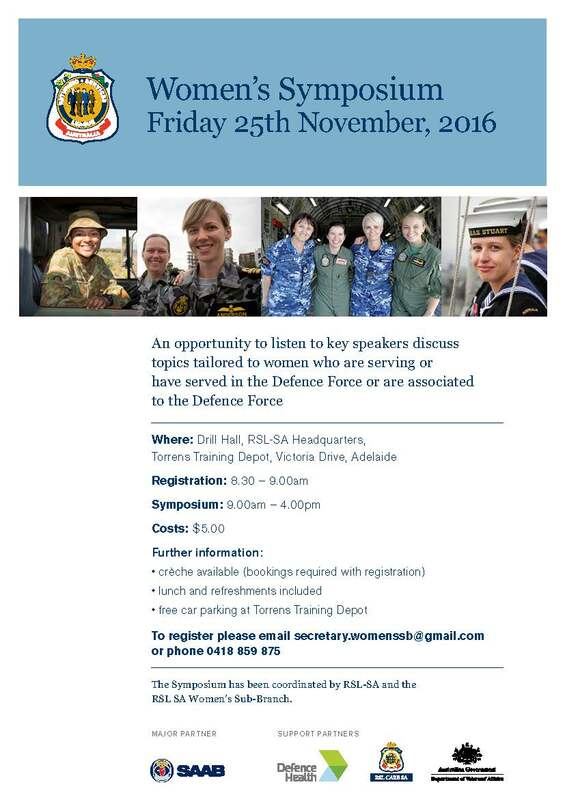 Are you an experienced advocate who is supporting current and former ADF members in accessing their DVA entitlements? Are you mentoring new advocates, or would like help develop the next generation of advocates? If so, ATDP has a training program to help you in this important work. As you may know, the Department of Veterans’ Affairs (DVA) is currently conducting the 2016 Client Satisfaction Survey. DVA has recently become aware of a scam asking clients for their personal details from a caller claiming to be conducting a survey on behalf of DVA. Any such requests are a scam and are not legitimate. The official DVA survey will not ask for any personal information beyond confirming your name and, where a carer/spouse is completing the survey on your behalf, their relationship with you. If you receive one of these calls do not provide the information. Hang up the phone and report the call to Scamwatch on 1300 795 995. The above SOPs take effect from 28 November 2016. In partnership with the Movember Foundation Australia, Soldier On is looking for male veterans affected by their service to participate in a focus group adressing issues of loneliness and isolation. These focus groups will be held in Sydney, Newcastle, Albury, Currumbin, Melbourne, Adelaide and Perth, for up to 12 veterans in each location. Movember is an organisation which focuses on men's health, which is why this study is focused on male veterans. However, female partners of affected veterans are also invited to participate in an online focus group. Welcome to the second issue of Advocacy News. This newsletter will keep you up to date with what’s happening in the transition from TIP to the ATDP. This edition focuses on recognition of prior learning and mentoring. 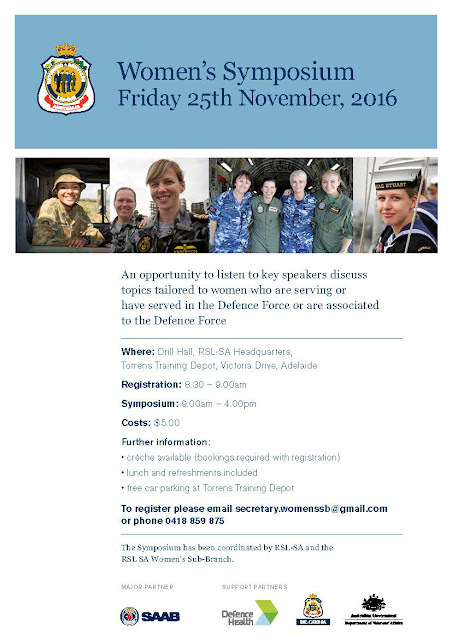 Book a place at the RSL-SA Women's Symposium for Friday 25th November and have the opportunity to listen to key speakers discuss topics tailored to women who are serving or have served in the Defence Force or are associated to the Defence Force. Applications are now open for recognition of prior learning (RPL) for Level 2 Welfare and Compensation Advocates. RPL for Levels 1, 3 and 4 will be available next year. Level 3 and Level 4 Compensation Advocates can also undertake Level 2 RPL if they wish as this will make their RPL at Level 3 or 4 quicker next year. Everyone is welcome to have their say on self-harm and suicide prevention services available to current and former members of Australia’s defence forces. In particular, ADF personnel, their families, friends and carers, are invited to share their experiences as are providers - including ex-service and community-based organisations - as well as health professionals. Your privacy is respected. All survey responses are confidential and you can choose to make a written submission without giving your name or other personal details. Your input will provide further information and advice to the federal government to help focus future activity so that improvements can be made for the benefit of current and former Defence personnel and those who support them. This review is being undertaken by the National Mental Health Commission. An interim report to government is due this December, the final report in February 2017. The survey and submissions close on Tuesday 22 November 2016. In the 2015 Budget, the Australian Government announced that it would be rebalancing the assets test limits to improve the fairness and affordability of the pension system. These changes have been passed by Parliament and will commence from 1 January 2017. More than 90 percent of pensioners will either be better off or have no change to their pension under the rebalanced assets test. There will be no change to the existing assets test exemption for the family home. Assessable assets include things like bank accounts, shares, investment properties and cars. The assets test affects service pension and income support supplement, as well as pensions paid under the social security law such as age pension. 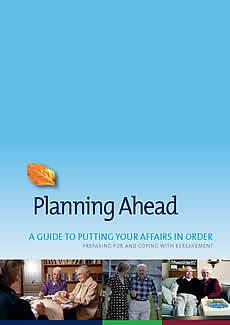 Compensation payments such as disability pension and war widow(er) pension are not affected. The rebalanced assets test will feature higher assets value limits, allowing pensioners to own a higher value of assets before their pension starts to reduce. Importantly, the increased assets value limits will continue to be indexed each 1 July. The changes mean that people may receive either an increased rate of income support pension, a reduced rate, or have no change, depending on individual circumstances. More info is available on the DVA website. 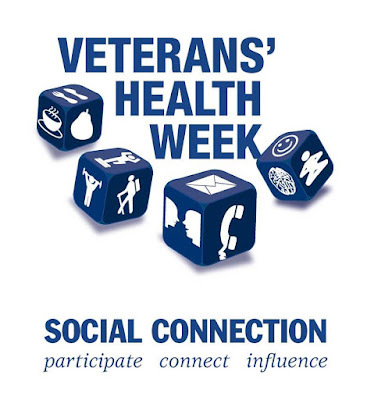 Veterans’ Health Week starts today. This year's theme is Social Connection. The week is an opportunity for veterans, war widows, widowers, current and ex-Australian Defence Force members and their families to participate, connect and influence the health and wellbeing of themselves and their friends. Here is a list of what's on in SA. DVA have had a number of enquiries through their Facebook Page recently regarding reports that DVA is making changes to the Safety, Rehabilitation and Compensation Act 1988 (SRCA). The Government will be introducing a Bill to make a standalone version of the SRCA for current and former Australian Defence Force (ADF) members. This means the Minister for Veterans’ Affairs would be responsible for all compensation Acts for ADF members. Currently, the Minister for Employment has responsibility for the SRCA. Should the new Act be passed by Parliament, eligibility and benefits under the Act will be the same as those currently available to serving and former ADF members under the existing SRCA. The new Act (if passed) will be the same as the current SRCA, so there will be no change to existing entitlements or access to benefits. 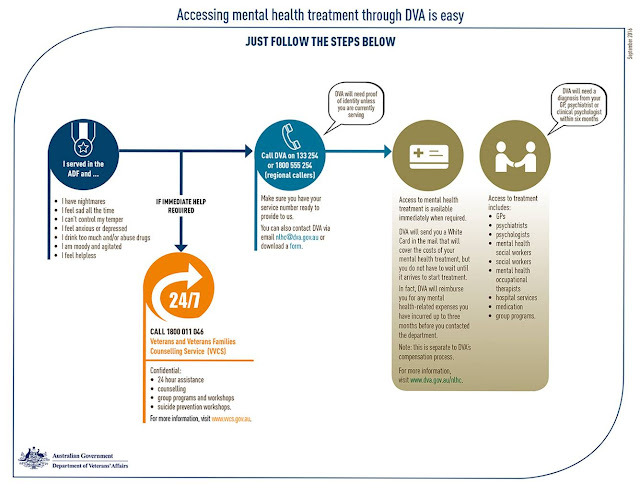 DVA has consulted ex-service organisations at regular national Round Table meetings, where representatives have been supportive of a standalone SRCA. The development of the new Act was referenced in a March 2015 media release of the former Minister for Veterans’ Affairs. The Veterans’ Entitlements Act 1986 (VEA) and the Military Rehabilitation and Compensation Act (2004) will remain in place and will be unchanged by the new Act. 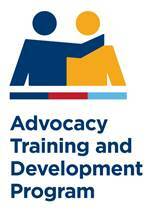 The Advocacy Training and Development Program (ATDP) is seeking applicants for upcoming mentor training and recognition of prior learning (RPL) workshops. It is hoped to hold some workshops before Christmas and there will be more next year. The location of the workshops will be determined by demand. It is expected that the first workshops will be in Sydney, Melbourne and Brisbane, with other locations to follow. · experienced TIP officers and advocates (Levels 2, 3 or 4) who would like to become mentors. To be eligible to attend you need to be endorsed by an official from your ESO, such as the president or secretary. They will also need to agree to cover your expenses if you need to travel to the workshop. · Mentoring: What mentoring is and why it is a key part of ATDP; the mentor’s role and responsibilities; and how to develop and support your ‘mentee’ (which is the modern word for protégé). · RPL: Your experience, knowledge and skills will be assessed for ATDP accreditation. You will be interviewed about your work, your TIP records will be reviewed, and you will complete some example case studies. If you’d like to register for a workshop, please fill out the online form www.atdp.org.au/applications/eois.php by 2400 AEDST on 23 October 2016. To complete the form, you will need to supply details of the official from your ESO who can be contacted to endorse your nomination. If you miss out on a workshop this time, your details will help us to plan next year’s workshops and you will be notified as soon as the dates are set.